First, I got to sit in on a rehearsal of the dragon, Fafner, at McCaw Hall. 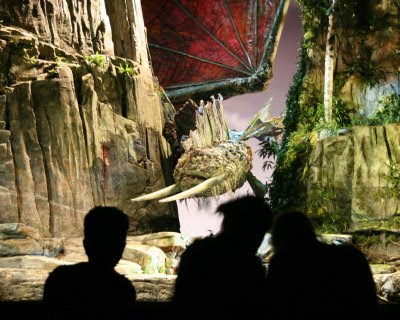 It was amazing to see Fafner in action – the dragon is huge! One of the crew members stood in for Siegfried and practiced fighting Fafner and stabbing his tail. At one point, Fafner’s head was being lowered down onto the set, and it kept moving for a little too long, and all the sudden, I heard a “creeeeak” – the tusk almost broke! Whoops…the crew fixed it promptly though! Above, the film crew shoots Fafner from the house. Later, I met with Chuck Whitmore, who works with the supertitles and the images projected on stage. He even put my name into the computer and made my name come up as a supertitle! That was really exciting; I felt so honored! He also showed me some of the projections for the end of the Ring cycle, with fire and water. I only got to see it on a computer screen, so I’m really excited to get to see the large projections during the full performance! Then I went back to the Seattle Opera offices and rehearsal spaces, and met up with Luretta Bybee and Emma Grimsley, two artists in the Ring cycle. And they’re mother and daughter! Luretta plays the First Norn and a Valkyrie, and Emma plays the Woman in Black. But that’s not all of their opera family! The father of the family, Greer Grimsley, plays Wotan! I asked them what it’s like being an opera family, and if it’s common to have a whole family of opera singers. They said they’re pretty much the only one! 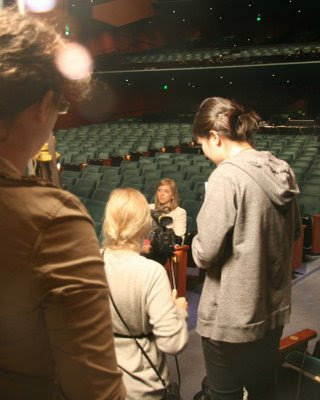 I also talked to Emma about what it’s like being a younger person involved in opera – she’s still in high school! She said she tries to get her friends interested in opera, and to get them to come see her shows. 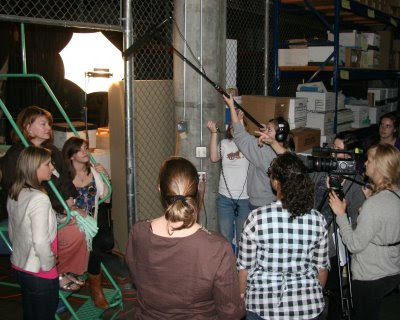 In this picture, the Reel Grrls crew captures the interview; Luretta is sitting on the steps to the left, Emma is sitting to the right, and I'm interviewing from the left side. As always, I learned a lot today! I’m seeing more and more pieces of the Ring cycle, and I can’t wait to see how they all fit together – only a few more weeks until the show! Photos by Ilona Rossman Ho.